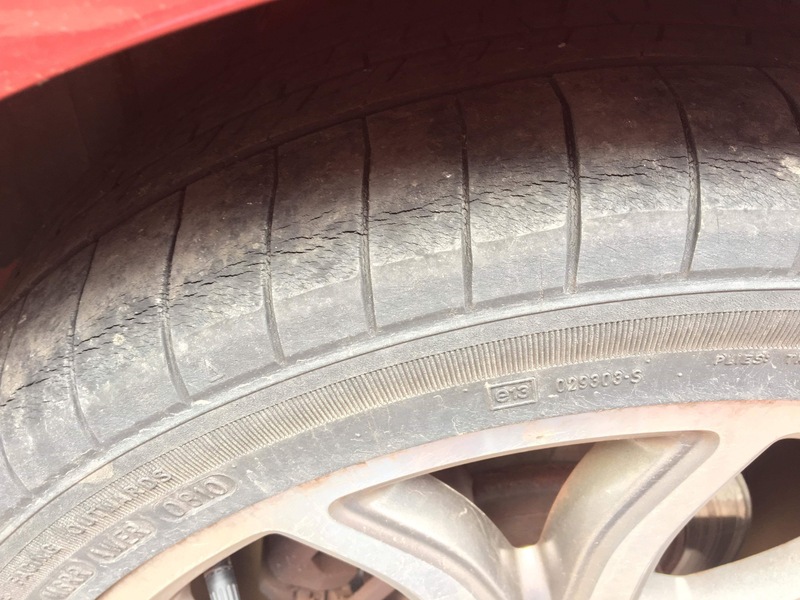 Do these cracks on my tires look bad? Your tires are nearly nine years old - a good rule of thumb is to replace tires at 6 years of age. And I'm sorry to say it but they don't look good - the big worry with cracks is the ones you can't see. The rubber will be degrading throughout the tire and this can lead to sudden and catastrophic failure when the tire comes apart. Are they safe to drive? No. If it was a matter of a low-speed drive round to get them changed that's one thing, they are less likely to fail under such low stress and if they do you stand a good chance of getting things under control without hurting yourself or others. Freeway driving? No chance - too big a risk IMO. Dry rot tire should I replace? Fishtailed so easily? Bad tires? ABS? Filling the tires with something other than air, to avoid puncture hassles? Used Michelin tires safe to install? Do these tyre cracks necessitate replacement? Is it possible to fix noisy feathered tires? Are bad winter tires still better than summer tires in winter? Torque converter failure - Related to replacing only 2 tires?